We strive to create Art That Sets You Apart. Our world has over 6.7 billion people and in that type of crowd, it’s difficult to stand out. However, with Club Creative Studio’s efforts, we provide you with an opportunity to strut your unique style, and share information on how you can also BE CREATIVE EVERYDAY. By learning how to express creativity and explore the creative process, we are more apt to enjoy being creative and think beyond the expected limits. We realize that life can be enhanced from our own creative ideas and actions. Here, at this blog we encourage you to explore your imaginative thoughts, learn about a technique, share an opinion, or just admire art. 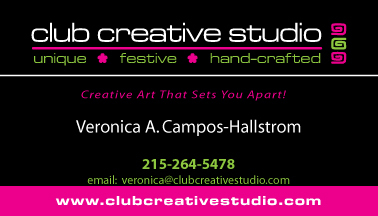 I am Veronica Campos-Hallstrom and I am an East Coast artist, degreed in Art and Education. As a former art teacher, I have a vast array of original lesson plans and creative ideas stored in my brain. This blog is a great place for me to sort them out and allow others to gain from what I can offer. Welcome to the Club Creative Studio blog. This is a place to find inspiration and insight on CREATIVITY. 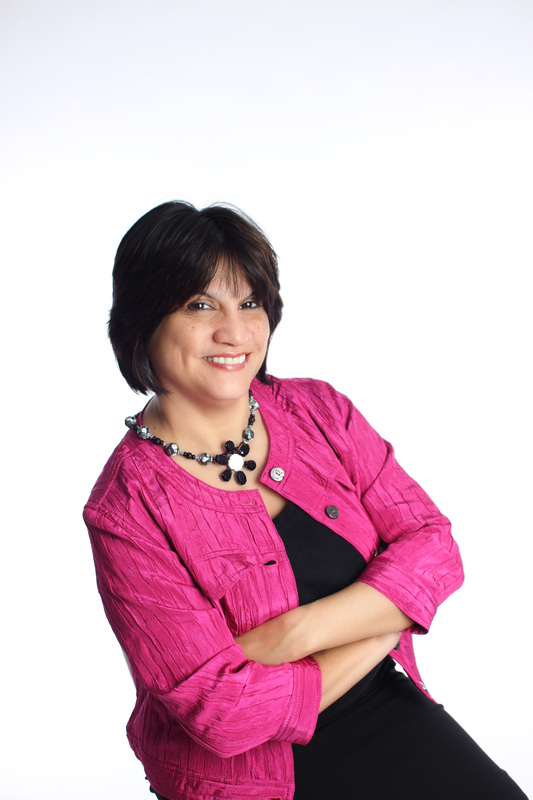 I share information that elaborates on creative opportunities, exercises and obstacles in the creative process. 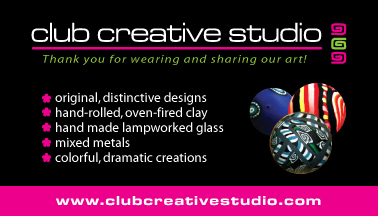 The Club Creative Studio blog offers weekly posts. The “TWO CENT TUESDAY” posts highlight low-cost products, projects, and inspiration to be creative on a shoe-string budget. The “THIS-N-THAT (TNT) THURSDAY” posts introduce topics worthy of instant approval that are explosive enough to spark an idea or inspiration inside of you. Please take the opportunity to click on the “thumbs up” icon to indicate that you especially like any post. The posts on “FEATURE FRIDAY” proudly take the opportunity to feature a hand-made creation directly from the Club Creative Studio. All items are one-of-a-kind, festive, fun and functional products. The posts on Friday showcase our art incorporating hand-rolled art clay beads, hand-torched Italian glass beads and hand-sculpted 99.9% pure precious metal silver beads and charms. Isn’t it great to have a focus and direction? Thanks. Great job on your elevator pitch!